Use Visual Studio Code to create an Azure function. Use VS Code and Docker to create a Docker image and publish it to a container registry. Deploy the module from the container registry to your IoT Edge device. 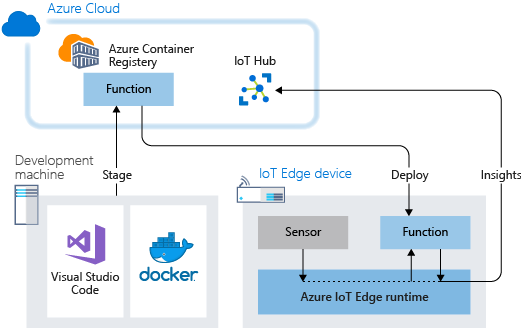 Azure Function modules on Azure IoT Edge are in public preview. The Azure function that you create in this tutorial filters the temperature data that's generated by your device. The function only sends messages upstream to Azure IoT Hub when the temperature is above a specified threshold. You can set up your development machine or a virtual machine as an Edge device by following the steps in the quickstart for Linux or Windows devices. A free or standard-tier IoT Hub in Azure. C# for Visual Studio Code (powered by OmniSharp) extension. Azure IoT Tools for Visual Studio Code. The .NET Core 2.1 SDK. 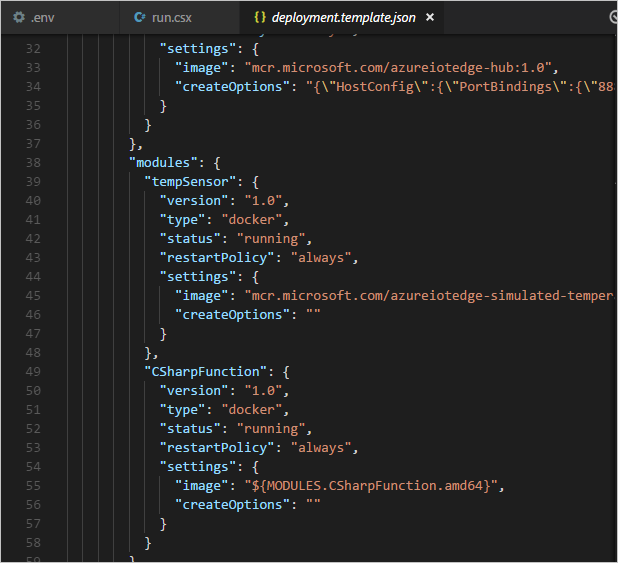 In this tutorial, you use the Azure IoT Tools for Visual Studio Code to build a module and create a container image from the files. Then you push this image to a registry that stores and manages your images. Finally, you deploy your image from your registry to run on your IoT Edge device. You can use any Docker-compatible registry to hold your container images. Two popular Docker registry services are Azure Container Registry and Docker Hub. 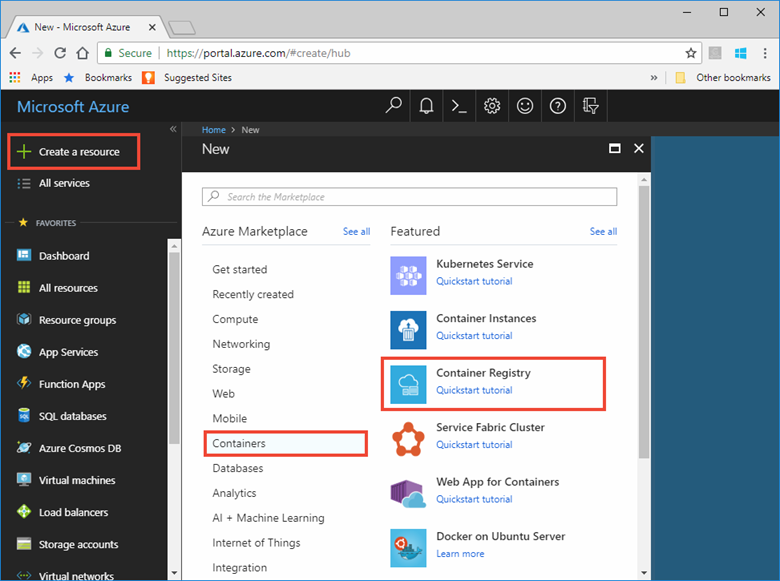 This tutorial uses Azure Container Registry. In the Azure portal, select Create a resource > Containers > Container Registry. Registry name Provide a unique name. Subscription Select a subscription from the drop-down list. Resource group We recommend that you use the same resource group for all of the test resources that you create during the IoT Edge quickstarts and tutorials. For example, IoTEdgeResources. Location Choose a location close to you. Admin user Set to Enable. After your container registry is created, browse to it, and then select Access keys. Copy the values for Login server, Username, and Password. You use these values later in the tutorial to provide access to the container registry. The Azure IoT Tools for Visual Studio Code that you installed in the prerequisites provides management capabilities as well as some code templates. In this section, you use Visual Studio Code to create an IoT Edge solution that contains an Azure function. Open Visual Studio Code on your development machine. Open the VS Code command palette by selecting View > Command Palette. In the command palette, enter and run the command Azure IoT Edge: New IoT Edge solution. Follow the prompts in the command palette to create your solution. Select folder Choose the location on your development machine for VS Code to create the solution files. Provide a solution name Enter a descriptive name for your solution, like FunctionSolution, or accept the default. Select module template Choose Azure Functions - C#. Provide a module name Name your module CSharpFunction. Provide Docker image repository for the module An image repository includes the name of your container registry and the name of your container image. Your container image is prepopulated from the last step. Replace localhost:5000 with the login server value from your Azure container registry. You can retrieve the login server from the Overview page of your container registry in the Azure portal. The final string looks like <registry name>.azurecr.io/CSharpFunction. The VS Code window loads your IoT Edge solution workspace: a .vscode folder, a modules folder, a deployment manifest template file. and a .env file. In the VS Code explorer, open modules > CSharpFunction > CSharpFunction.cs. Replace the contents of the CSharpFunction.cs file with the following code. This code receives telemetry about ambient and machine temperature, and only forwards the message on to IoT Hub if the machine temperature is above a defined threshold. // Get the body of the message and deserialize it. // Send the message to the output as the temperature value is greater than the threashold. // Copy the properties of the original message into the new Message object. // Add a new property to the message to indicate it is an alert. //Define the expected schema for the body of incoming messages. In the previous section, you created an IoT Edge solution and added code to the CSharpFunction to filter out messages where the reported machine temperature is less than the acceptable threshold. Now you need to build the solution as a container image and push it to your container registry. In this section, you provide the credentials for your container registry twice. The first is to sign in locally from your development machine so that Visual Studio Code can push images to your registry. The second is in the .env file of your IoT Edge solution, which gives your IoT Edge device permissions to pull images from your registry. Open the VS Code integrated terminal by selecting View > Terminal. Sign in to your container registry by entering the following command in the integrated terminal. Use the username and login server that you copied from your Azure container registry earlier. When you're prompted for the password, paste the password for your container registry and press Enter. In the VS Code explorer, open the deployment.template.json file in your IoT Edge solution workspace. This file tells the IoT Edge runtime which modules to deploy to a device. Notice that your Function module, CSharpFunction is listed along with the tempSensor module that provides test data. To learn more about deployment manifests, see Understand how IoT Edge modules can be used, configured, and reused. Open the .env file in your IoT Edge solution workspace. This git-ignored file stores your container registry credentials so that you don't have to put them in the deployment manifest template. Provide the username and password for your container registry. In the VS Code explorer, right-click the deployment.template.json file and select Build and Push IoT Edge solution. When you tell Visual Studio Code to build your solution, it first takes the information in the deployment template and generates a deployment.json file in a new folder named config. Then it runs two commands in the integrated terminal: docker build and docker push. These two commands build your code, containerize the functions, and then push the code to the container registry that you specified when you initialized the solution. Visual Studio Code outputs a success message when your container image is pushed to your container registry. If you want to confirm the successful operation for yourself, you can view the image in the registry. In the Azure portal, browse to your Azure container registry. You should see the csharpfunction repository in the list. Select this repository to see more details. In the Tags section, you should see the 0.0.1-amd64 tag. This tag indicates the version and platform of the image that you built. These values are set in the module.json file in the CSharpFunction folder. You can use the Azure portal to deploy your function module to an IoT Edge device like you did in the quickstarts. You can also deploy and monitor modules from within Visual Studio Code. The following sections use the Azure IoT Tools for VS Code that was listed in the prerequisites. Install the extension now, if you didn't already. Search for and run the command Azure: Sign in. Follow the instructions to sign in your Azure account. In the command palette, search for and run the command Azure IoT Hub: Select IoT Hub. Select the subscription that has your IoT hub, and then select the IoT hub that you want to access. 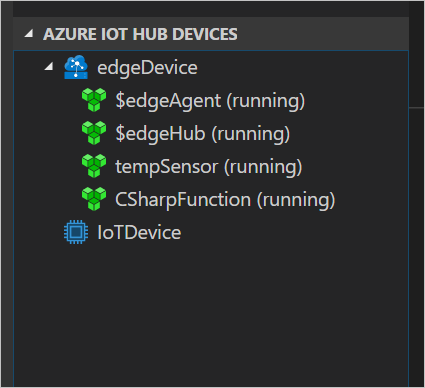 In the VS Code explorer, expand the Azure IoT Hub Devices section. Right-click the name of your IoT Edge device, and then select Create Deployment for single device. Browse to the solution folder that contains the CSharpFunction. Open the config folder, select the deployment.json file, and then choose Select Edge Deployment Manifest. Refresh the Azure IoT Hub Devices section. You should see the new CSharpFunction running along with the TempSensor module and the $edgeAgent and $edgeHub. It may take a few moments for the new modules to show up. Your IoT Edge device has to retrieve its new deployment information from IoT Hub, start the new containers, and then report the status back to IoT Hub. You can see all of the messages that arrive at your IoT hub by running Azure IoT Hub: Start Monitoring D2C Message in the command palette. You can also filter the view to see all of the messages that arrive at your IoT hub from a specific device. Right-click the device in the Azure IoT Hub Devices section and select Start Monitoring D2C Messages. To stop monitoring messages, run the command Azure IoT Hub: Stop monitoring D2C message in the command palette. If you plan to continue to the next recommended article, you can keep the resources and configurations that you created and reuse them. You can also keep using the same IoT Edge device as a test device. Otherwise, you can delete the local configurations and the Azure resources that you created in this article to avoid charges. Deleting Azure resources and resource groups is irreversible. Make sure that you don't accidentally delete the wrong resource group or resources. If you created the IoT hub inside an existing resource group that has resources that you want to keep, delete only the IoT hub resource itself, instead of deleting the resource group. Sign in to the Azure portal and select Resource groups. Select the name of the resource group that contains your IoT Edge test resources. Review the list of resources contained in your resource group. If you want to delete all of them, you can select Delete resource group. If you want to delete only some of them, you can click into each resource to delete them individually. If you want to remove the IoT Edge runtime and related resources from your device, use the appropriate commands for your device operating system. Uninstall the IoT Edge runtime. When the IoT Edge runtime is removed, the containers that it created are stopped, but still exist on your device. View all containers. Delete the runtime containers that were created on your device. Delete any additional containers that were listed in the docker ps output by referring to the container names. Remove the IoT Edge runtime. In this tutorial, you created an Azure function module with code to filter raw data that's generated by your IoT Edge device. When you're ready to build your own modules, you can learn more about how to Develop Azure functions with Azure IoT Edge for Visual Studio Code. Continue on to the next tutorials to learn other ways that Azure IoT Edge can help you turn data into business insights at the edge.